With a stay at Luxor Hotel and Casino in Las Vegas (Las Vegas Strip), you'll be a 4-minute drive from T-Mobile Arena and 13 minutes from Las Vegas Convention Center. This casino resort is 0.4 mi (0.6 km) from MGM Grand Casino and 0.6 mi (1 km) from Park Theater. A business center provides printing, faxing, copying, and other services (surcharges). Luxor features retail stores selling a wide array of items from unique to stunning jewelry and designer wear. A 12,000-square-foot health spa, the Nurture, Spa at Luxor, includes men's and women's relaxation lounges, hair salon, salon treatments, saunas, and steam rooms. This property charges a daily resort fee which includes property-wide high speed internet access (public spaces and in-room), unlimited local and toll free calls, airline boarding pass printing, and fitness center access for guests 18 and up. 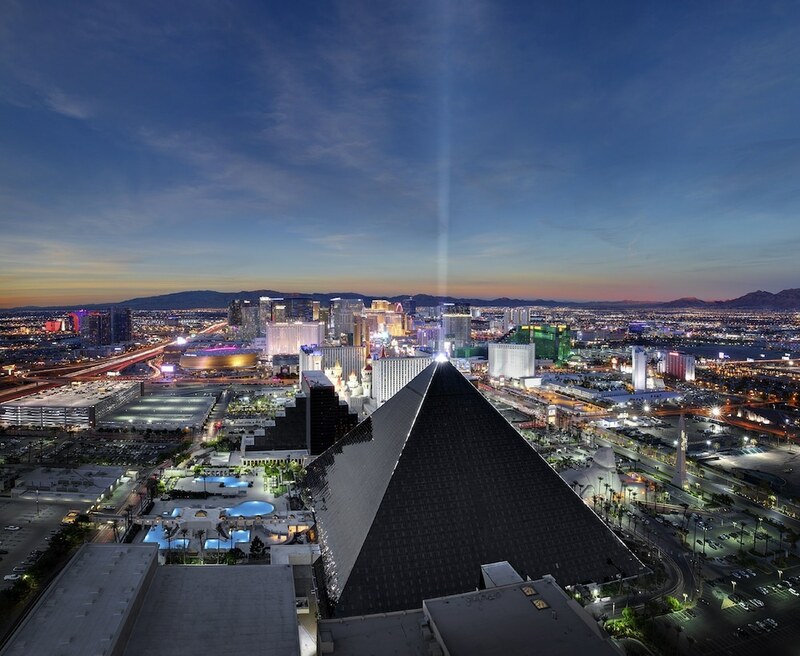 Located 2 miles from McCarran International Airport, the Luxor Hotel is 4 miles from the Las Vegas Convention Center and within 6 miles of the downtown district. An expansive pool complex is open seasonally. In winter, Luxor guests have access to the adult-only and all-ages pools at the Excalibur by showing their Luxor room keys. Nurture Spa serves as a great place to relax after the excitement of Luxor's gaming floor in the casino. In addition to a fine-dining seafood and steakhouse, the resort's venues include a 24-hour café, a deli, a food court, 3 Starbucks, and Mexican, Pan-Asian, and buffet restaurants. This property is wheelchair accessible. Diablo's Cantina - Unique brand of south-of-the-border dining and drinking. Diablo’s features a wide variety of specialties including freshly made salsas and guacamole, along with entrees like the Grilled Shrimp Burrito and the Vixen Chicken. Rice and Company - Featuring fresh, tasty and healthy Asian Cuisines with the motto "Eat Rice, Drink Tea, Slurp Noodles, Stay Healthy," this venue serves modern Japanese and Chinese cuisine at the Luxor. Located near the entrance of Mandalay Place, this enticing casual dining alternative offers an intriguing menu of tropically influenced variations of sushi and sashimi, as well as hibachi, teriyaki and Chinese food classics. Public House - This restaurant serves lunch, dinner, and late-night menus, as well as a "Happy Hangover Brunch." The social scene caters to those checking into the hotel looking for a vibrant happy hour and sports fans looking for a great spot to watch their favorite teams. A wall of flat-screen TVs provides optimal views of several games, or 1 big screen featuring a major sporting event. Other TVs are situated throughout the bar and restaurant. TENDER Steakhouse - Open for dinner, this fine-dining restaurant features prime-grade beef and a casino-view lounge with an appetizer menu and featured pianist. The Buffet - Serving breakfast, lunch, and dinner buffets, this restaurant offers a sparkling wine brunch on Saturday and Sunday from morning until mid-afternoon. Pyramid Café - Located in the casino, this restaurant serves salads, burgers, steaks, and pizzas. Flight - Lounge featuring modern cocktails, specialty beer and creative beverage presentations. Aurora - A lounge designed to resemble the Aurora Borealis, also known as the Northern Lights, this spot offers European bottle service, wine service, and martinis poured tableside. Open 24 hours. High Bar - Located by the High Limit Area, this bar serves cocktails, wine, and beer in a casual setting with plasma TVs. Playbar - Located by the Race and Sports Book, this bar serves cocktails, wine, and beer in a casual setting with plasma TVs. Backstage Deli - This self-service deli is open days and evenings. Food Court - Bonanno's Pizzeria, LA Subs, Nathan's, Original Chicken Tender Company and Starbucks Coffee. Starbucks - There are 3 locations for coffee drinks and pastries. Nurture, Spa at Luxor offers a wide menu of treatments and services (surcharges), such as Peppermint Foot & Leg Therapy, scrumptious body treatments and Hot Stone Massages. Specific treatments for men and for guests in a hurry are available. This health spa provides saunas and steam rooms. Guests may check-in at the North Lobby for easy access to the Tower Rooms. Bed type is based upon availability for the Pyramid Deluxe category and will be assigned at check-in. For more details, please contact the property using the information on the reservation confirmation received after booking. Vehicles that are self-parked for more than one hour are subject to a parking fee. The self-parking fee is USD 6 for vehicles parked 1-2 hours, USD 8 for 2-4 hours, and USD 10 for 4-24 hours. The valet parking fee is USD 14 for 0-4 hours and USD 16 for 4-24 hours. All parking fees repeat each 24-hour period. The parking fee provides registered guests with in-out privileges within the same parking type (self or valet) across all MGM Resorts destinations. The seasonal pool will be open from April to November. The property has connecting/adjoining rooms, which are subject to availability and can be requested by contacting the property using the number on the booking confirmation.